Need some extra boost for your sound? Got an amp that needs more drive? Do you need a good clean boost for solos? Have those musical moments that need something extra to push them over the top? Well NASA* recommends you plug into a Rocktron Reaction Super Booster. (That’s *National Association of Super Abilities). 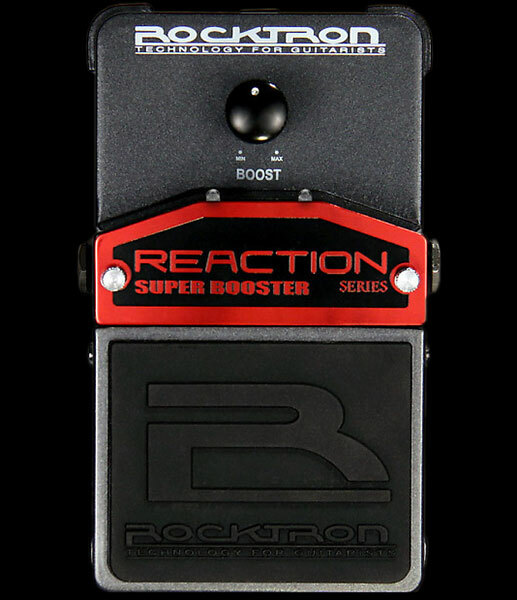 The Reaction Super Booster provides up to 20dBu of gain, while enhancing the tonal response of your guitar with your amplifier. Using a singular FET ultra high impedance input stage that is analogous to a tube stage, the Super Booster can rise to any occasion and give the warmth and soft clipping when boost is all the way up that only a FET can provide. Rocktron’s Reaction Series pedals are built into a rugged metal slim form factor chassis, taking up as little space as possible on your pedal board. The Reaction Super Booster is a TRUE BYPASS pedal: when you turn it off…it is out of your signal path! A simple control called BOOST determines the Gain applied to the input source. How much extra do you need? Get solos and special effects jumping out of the mix with higher setting of the BOOST control. By using lower settings of the BOOST control you will find extra edge in your chords. Lower settings will also give you enhanced articulation. The Reaction Super Booster pedal sounds great when placed before all other stomp boxes in your signal chain. While it provides up to 20dB of boost, different amplifiers with different settings may sound better while implementing the Super Booster. You can use the Reaction Super Booster as a solo boost by inserting it last in your pedal chain. All you need then is a slight amount of gain (say +6dBu, which can be reached by setting the BOOST knob around the 9:00 o’clock position). At that point, when you want to go for a solo (clean or distortion) just use the Super Booster. You will love it! If you have an amp with typical distortion, use the Reaction Super Booster and turn it into a Sonic Titan Rocket! Once you try the Reaction Super Booster, you will never leave for a gig without it. The footswitch on the Reaction Super Booster controls On/Off status as shown by the LED indicator. Reaction stomp boxes run on a 9V Alkaline battery, or may also be powered by Rocktron’s DC OnTap Universal Power Supply adaptor.